The United States welcomes overseas citizens, who wish to come to the US for studies. USA Student visa can be categorized as F-1 visa and M-1 Visa depending on course of study and the school. Students are required to attain an US F-1 visa or an M-1 visa for travel to USA. Prior to their travel they are expected to have the approval of school, where they intend to study. Upon approval, the applicant will be enrolled in the SEVIS also known as Student and Exchange Visitor Information System and pay the necessary fees. The school will provide the applicant with Form I-20 to be given to the consular when he/she attends an interview. Applying for a USA student visa involves various steps which may vary at the US embassy or consulate, where the applications are filed. Schedule an appointment at a US embassy or consulate in the country of residence. The country offers wide range of educational institutions and courses. 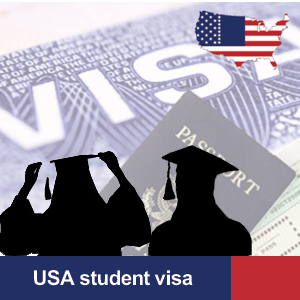 To be qualified to apply for USA student visa the students have to meet certain requirements. Few of them include possessing a valid passport Confirmation page of Form DS-160 for non immigrant visa application and so on.